Do you know what the Aurora is? This word can have several different meanings. Above all, it can be Russian battleship, which changed a history of a mankind for following eighty years by the only one shot. Then, a man from Moravian region Hana can cry it when he has stumbled over oil pipeline Druzhba. The word "aurora" also means glare or light. 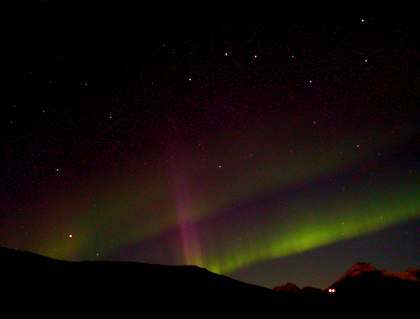 And that's what we're looking for - Lights, better Polar Lights or Northern Lights, accurately Aurora Polaris Borealis. Vertical walls, localized at about 70° of southern and northern latitude, occur during higher Sun activity. The wall is several tens of kilometers thick, linear dimensions are counted in thousands of kilometers. The wall is oriented along force lines of the magnetic field of the Earth. A discharge with current density ~ 30 µA/m2 generating own magnetic field proceeds in the layer. The first more detailed research of current walls on the Earth performed TRIAD satellite in 1976. The first detection, however, originates already from year 1966 (navigation satellite 1963-38C). The Northern Lights are known with associated effects of the discharge. Excited electrons in Oxygen atom envelopes flare within deexcitation with characteristic green and red light, Nitrogen molecules with blue one. 19 Sep 2002 22:20. Northern Lights under Ursa Major. Photo Pavel Brichnac. 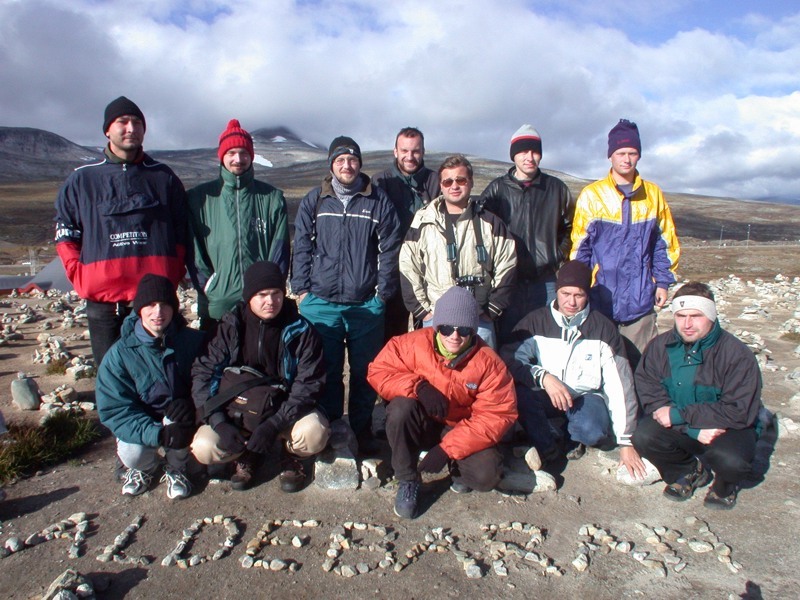 Twelve people of the association Aldebaran, Department of Physics FEE CTU, observatory Petrin and observatory Rokycany took an expedition beyond a polar circle from September 12 to 29, 2002. The expedition was named Aurora 2002. A diagrammatic sketch of current density measurement by satellite Triad was chosen as its logo. Circles denote latitudes 60°, 70° and 80°, orange and blue zones are current walls (aiming upwards and downwards) flowing approximately on the 70th latitude. The expedition took twenty days. We had passed 8500 km by three cars. We went through three ferries (two long ones, eleven hours and four hours, and a short one over a fjord). We visited the Oulu university and observatory in Helsinki. The northernmost point, we had achieved, was the North Cape (71° 10' 21"). We observed lovely auroras six times. David Bren, Pavel Brichnac, Milan Cervenka, Jiří Hofman, Vaclav Kaizr, Petr Kulhanek, Rostislav Medlin, Jan Pasek, Jakub Rozehnal, Karel Rezac, Michal Stransky, Dan Skandera. Prague - Copenhagen: We leave early in the morning on September 12 from faculty, Prague. We sleep in a hostel close to Copenhagen (night 12/13). Stockholm: Sep 13, we arrive to Stockholm. The exhaust of borrowed car has come off. 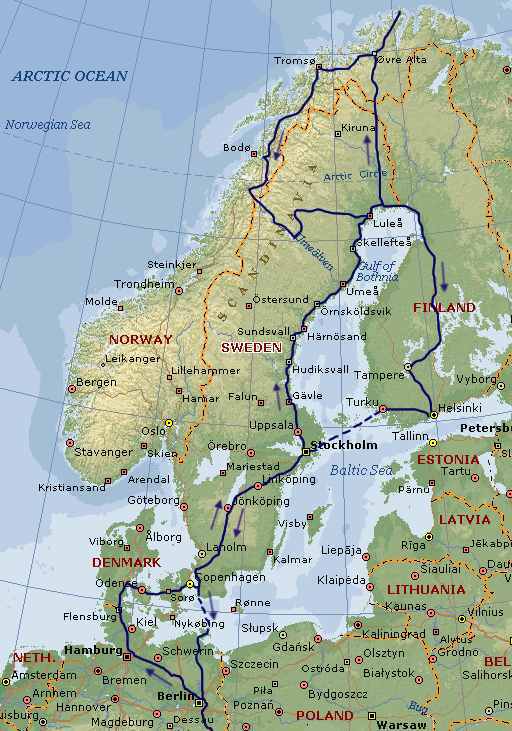 We take up Jiri Hofman and we stay overnight in tents behind Stockholm (night Sep 13/14). Skelleftea: Another stay overnight within the journey to the North close to Skelleftea (night 14/15). Alta: The night deep in the north beyond the polar circle. The tents have been unpacked on a lay-by close to the sea (night 15/16). North Cape: Sep 16, we go to the North Cape, the northernmost cape of Europe. Bitter weather, a comfortable information center with a nice movie about the cape. Alta: We sleep on the same place like yesterday. It is cloudy but the first aurora strikes through the clouds. Later, we will learn about coincidence with increased flow of particles from the Sun (night 16/17). 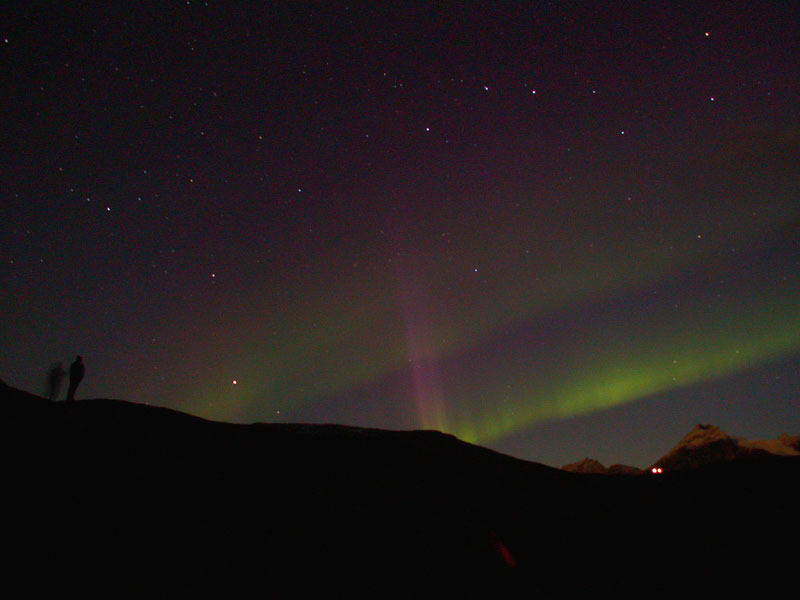 Tromso: We see two beautiful auroras within the night. We have built a camp on a meadow next to a building where a woman has declined to recharge our batteries (night 17/18). Narvik - Skjorndalen mountains: We stay on the table-land over two nights and observe another auroras again (nights 18/19/20). We undertake a trip into the mountains the second day. Saltstraumen: We go further southwards to watch whirls (maelstroms) shaping in straits between two fjords every six hours (at flux and reflux). A part of us spends the night in a fishing hotel, other part in the tents (night 20/21). Svartisen: The nature reserve with a nice glacier lake. We stay overnight in a tourist cottage (night 21/22). We undertake a trip to the glacier, which is 10 km far, in the morning. Oulu: We sleep at a student's flat of friend Jana (night 23/24). A hydra called Veronika plagues us. We visit The University of Oulu next day. Tampere: A call of Jiri at Tampere. We stay two nights (24/25/26). We visit a proper Finnish sauna. Helsinki: A visit of university observatory (26). Turku/Stockholm: A ferry from Finland to Sweden lasting eleven hours which fascinates us. Pavel didn't found a jacket, cap and gloves till now. (night 26/27). Trelleborg/Sasnitz: A four hours long ferry from Sweden to Germany (27). Prague: Arrival back on September 28 in the morning.